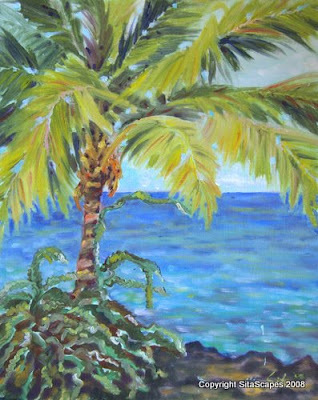 Artists Comments: There is a small grassy oasis overlooking the mouth of Honokohau Harbor which I have overlooked all these years. Typically I am distracted by snorkeling at the small sandy beach or, busy boarding a boat bound for whale watching or an afternoon sail ~ so distracted that I have not paid much attention to this lazy little spot. I decided to try a larger canvas and brought out the largest brushes I own. I enjoyed the larger movements my body made as I slapped down the leaves of this lonely baby palm tree bidding farewell to all those busy captains. At home, I decided to step up the color a notch and threw in some brighter oranges and yellows into the painting to help add some movement. I contrasted these highlights with some really dark shadows to make them pop.